Star Phillies pitcher Cole Hamels (right) and his wife Heidi (left) present the ceremonial check for $10,000 to representatives of St. Jerome School for a new STEM (science, technology, engineering and math) lab at the Northeast Philadelphia school come September. St. Jerome School in Northeast Philadelphia recently received a $10,000 Partners in Education grant from the Hamels Foundation to supply and furnish a STEM Lab in the school. Award checks were presented by Cole and Heidi Hamels on Friday, May 30 at School Media Day at West Philadelphia High School. St. Jerome is one of only six schools in the city of Philadelphia to receive the grant. 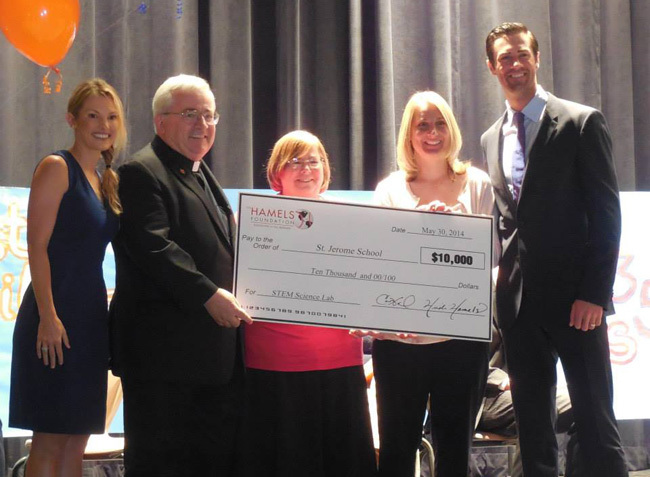 The St. Jerome Advancement Board, which announced the good news, is very grateful for the generosity of the Hamels Foundation. The school’s new STEM (Science, Technology, Engineering and Mathematics) Lab, opening in September, will be a center of collaboration that houses resources for students and teachers such as science equipment, mathematics manipulatives, engineering construction sets and technology devices. 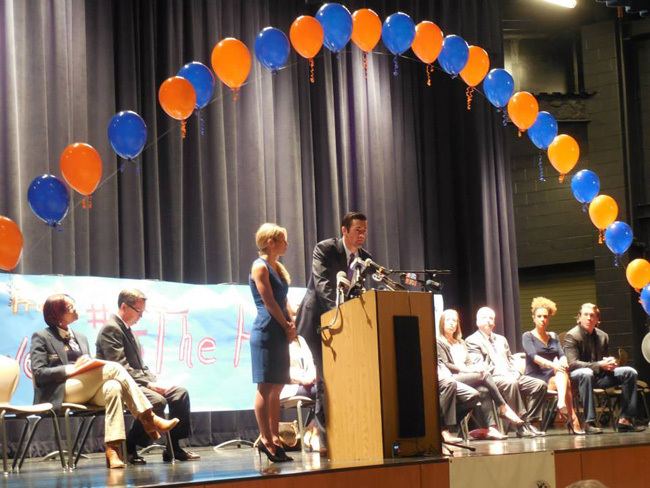 Cole Hamels speaks during the award event along with wife Heidi at West Philadelphia High School Friday, May 30.